I originallybegan reading this book thinking that it would be light weight fiction and summer reading. 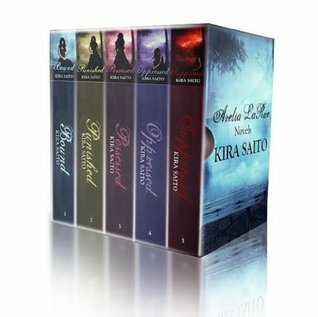 The first book in the series proved to be exactly that, but then Saito,literary genes accelerate and she begins to weave a wonderful story. She gets back to the art of storytelling and creates a stir for the printed word. Without giving the stories away, if u are considering reading this book, be prepared to expound on your vocabulary, love for culture as well as literacy of food! Saito fills a page with words and illicit images that will stir in your thoughts, even through closed pages. Readers, be prepared to go on a journey of twist in turns, and dissect human nature. Learn the power of love and living with wounds that just won't heal, but fester and personify ..even in death. Think:Quantum leap meets 12 years a slave and ask yourself "what would u do for love"? Book 4 is the best of all..this could stand alone!I eagerly await the final chapter "Bonsoir sweet Cecile"
Amazing. I finished the book in 2 days. Working on the fifth now. It was interesting Too much teen angst and typos. But a good story. I really enjoyed the New Orleans realism. But it really could've been two books. I undoubtedly LOVED these books and can't wait for #6to come out! The rich history if brings to light not only about slavery but new voodoo and the beautiful culture being pictured of new Orlando is beautiful. All the while a twisted love story of not only lovers romance but friendship! Such an amazing book! Great to go back in time!Finally finding out what happened was an exciting thing for me. I will be reading the next one soon! Remember this is a series and it should be read in order. Enjoy! Very interesting and a welcomed change.Just everything about this story sucked me in. Makes you think about making the right choices and being true to yourself. Loved the books.Can't wait for the story to continue. Love the characters. I felt like I was there, a witness to what was happening.